Discussion in 'Game Help' started by Tycoo8, Dec 20, 2015. Present the blue-backed card. 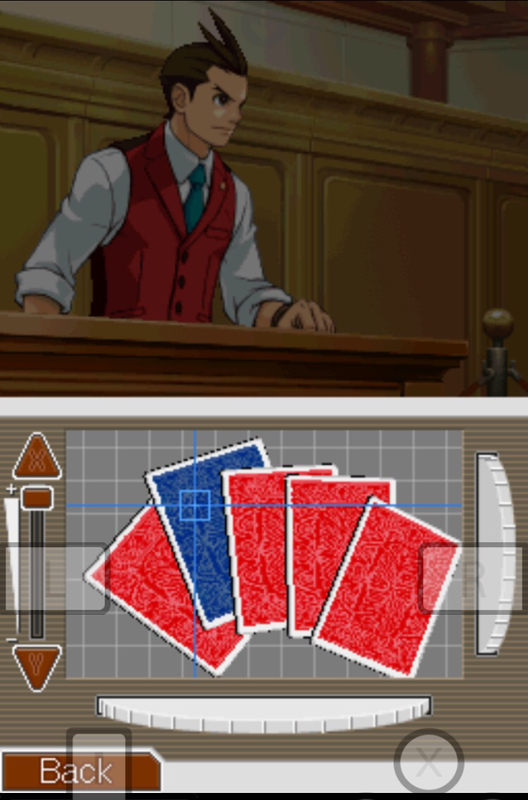 Seeing this, Olga will inadvertently say that she thought she puthdhhshit in Wright's hand. I actually saw that post before I made this one and unfortunately you can't do that because you don't have that evidence yet, at least I don't for some reason. Is this whats happening ? I found this reddit thread . This can help you. -disable "Mutlithreaded 3D rendering" if there is any option to do tgis in nds4ios. Yes that's exactly what's happening. Unfortunately there's no option for this on nds4ios and I'm trying everything but the examine button isn't showing. I decided to do this however: I'm gonna download the game and an emulator on my computer, load my save via Dropbox, and do that part on my computer then save it to Dropbox and load the save on my phone. Thank you for the help though. Yeah, that's 1 way to resolve your problem. Although,you might need to use an NDS Save File converter should the save file copy you've on the iOS not compatible with the PC emulator. yes playing the part on pc would also do it. Haha, yep! I was able to do it! I can now move past that part on my phone! Wait? how did you get past it on your phone if you couldn't before? He must have copied the .sav file from his phone to pc, and play the part he couldn't using a pc emulator, before returning it back to the phone. Hey bro, I'm on iOS 9 with my iPhone 6s too, but cannot get NDS4iOS back. I follow many tutorials that look like this one https://iphonebyte.com/download-nds4ios-nintendo-ds-emulator/ They show a few methods to install this app but none of them work for me Sorry to post in this thread, but if you know please let me know. I really appreciate it.